Paper Palette: Emossed-dry and wet!! Here is another project which I have pulled out just in time for the ICR blog hop. 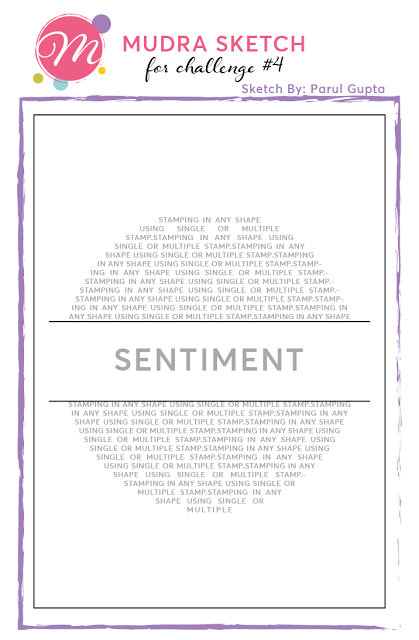 In this card I have used both dry as well as wet embossing. 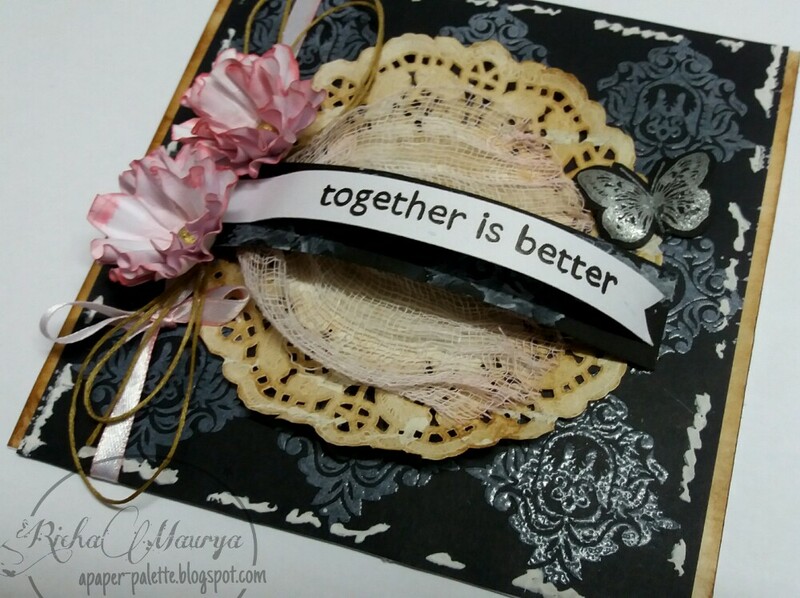 ●I took a black cardstock and stamped Mudra's Damask stamp multiple times using Versacolor white ink. Heat embossed it. ●Then I took a paper doily and distressed it with vintage DI. 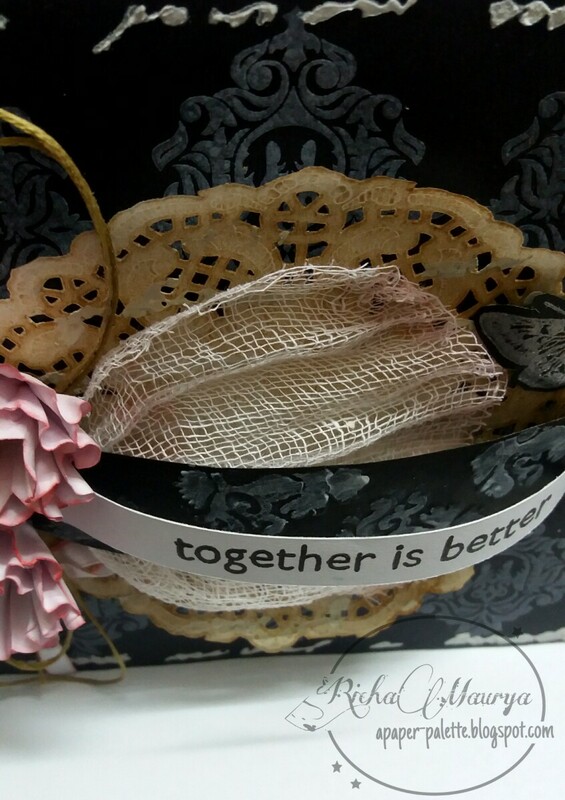 Next applied homemade texture paste on card corner as well as on the doily through script stencil. ●Then attached the doily on cardstock and arranged a gauze over it. Added a Ribbon, thread and two hand made flowers. The centre of the flowers are dried seeds of heena plant painted gold. ●The central black strip is embossed using Sizzix embossing folder and rolling pin(as I don't have an embossing machine yet). To give it similar look as heat embossed one, I applied some gesso on the elevated part. ●Added the sentiment and a embossed butterfly. ●Finally mounted the black cardstock on white card distressed vintage. ICR Blog Hop- Emboss Me Anything WET or DRY! Thank you Preety..Glad that you liked it!! This is so beautiful Richa! 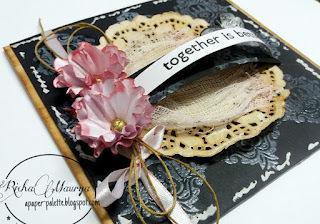 Thanks for sharing this beautiful creation at ICR Blog Hop!